This view of the ankle-assisting exosuit shows its soft robotic elements and the cable that transfers mechanical power from actuators operated from the hip to the ankle joint. Walking upright on two legs is a defining human trait, but it’s one that can vanish in the blink of an eye. About 80 percent of stroke patients typically lose normal function in one limb, a clinical phenomenon called hemiparesis. Even patients who recover mobility with rehabilitation can have abnormalities in their gait that keep them from participating in many activities, increase their risks of falling, and, because of the more sedentary lifestyle they impose, lead to secondary health problems. 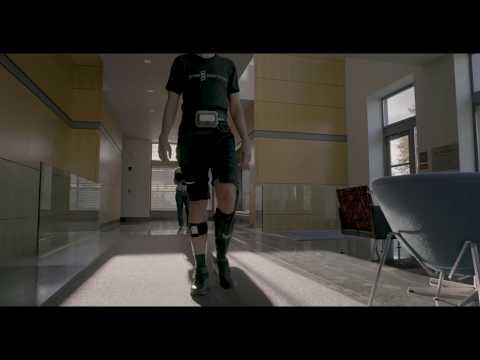 To help these patients regain their ability to walk, robotics groups from industry and academia are developing powered wearable devices — known as exoskeletons — that restore gait functions or assist with rehabilitation. In the past, these systems could be used only on a treadmill in a clinical setting, but in recent years developers have created portable systems. Working toward the long-term goal of developing soft robots that can be worn as clothing, researchers at the Wyss Institute for Biologically Inspired Engineering, Harvard John A. Paulson School of Engineering and Applied Sciences (SEAS), and Boston University’s College of Health & Rehabilitation Sciences: Sargent College have developed a lightweight, soft, wearable, ankle-assisting exosuit that can reinforce normal gaits in people with hemiparesis after stroke. In previous studies performed in healthy people, the team had demonstrated that their exosuit technology could help wearers walk and jog and produced marked reductions in energy costs. Now, in a study published in Science Translational Medicine, a research team led by Conor Walsh, the John L. Loeb Associate Professor of Engineering and Applied Sciences at SEAS and founder of the Harvard Biodesign Lab, collaborating with BU faculty members Terry Ellis, Louis Awad, and Kenneth Holt, has demonstrated that exosuits also can be used to improve walking after stroke — a critical step in de-risking exosuit technology toward real-world use. Patients recovering from a stroke develop compensatory walking strategies to deal with the inability to clear the ground with their affected limb and to “push off” at the ankle during forward movement. Typically, in order to walk they have to lift their hips (hip hiking) or move their affected foot forward in an outward circle (circumduction) rather than in a straight line. Usually, rigid plastic ankle braces are prescribed to help with walking, but they do not help correct the abnormal gait patterns in about 85 percent of post-stroke patients. “Current approaches to rehabilitation fall short and do not restore the mobility that is required for normal life,” said Ellis, director of the Center for Neurorehabilitation at Sargent College and an assistant professor at BU. In the new study, the team asked whether the exosuit would have the same beneficial impact on gait mechanics and energy expenditure on post-stroke patients as it did on healthy people. Exosuits are anchored to the affected limb of a hemiparetic patient via functional apparel, and apply gait-restoring forces to the ankle joint by transferring mechanical power via cable-based transmission from battery-powered actuators that are integrated into a hip belt or an off-board cart placed next to a treadmill. “Indeed, in treadmill experiments we found that a powered exosuit improved the walking performance of seven post-stroke patients, helping them to clear the ground and push off at the ankle, thus generating more forward propulsion,” said SEAS graduate student Jaehyun Bae, a co-first author on the study. Interestingly, the team also observed reduced functional asymmetry between participants’ paretic and non-paretic limbs, and found that they walked more efficiently with the exosuit. Because walking mechanics and dynamics are different on a treadmill and in the home or communal environment, the team assessed the exosuit’s benefits in an overground walking experiment. “It was extremely encouraging to see that an untethered exosuit also had the ability to facilitate more normal walking behavior during overground walking. This is a key step toward developing exosuits as rehabilitation devices for patients to use outside of the clinic and in their normal lives,” said Awad, the study’s other co-first author, who at the time of the study was a postdoctoral fellow with Walsh and since has become an associate faculty member at the Wyss Institute and assistant professor at Sargent College. In ongoing and future research, the team wants to personalize exosuit assistance to specific gait abnormalities, investigate assistance at other joints such as the hip and knee, and assess the longer-term therapeutic effects of their technology. In addition to this research, Wyss Institute staff member Kathleen O’Donnell is leading the institute’s efforts to translate the technology to the clinic with industrial partner ReWalk Robotics. “In an ideal future, patients post-stroke would be wearing flexible adjusting exosuits from the get-go to prevent them from developing inefficient gait behaviors in the first place,” said Ellis. Other co-authors were Holt, an associate professor at Sargent College; Stefano De Rossi, Lizeth Sloot, Pawel Kudzia, and Stephen Allen, former and current members on Walsh’s team; and Katy Hendron, who worked in Ellis’ group at BU. “This study provides a glimpse of a new future where much of patient care will be carried out at home with the help of human-friendly robots, which look nothing like the robots we see in television and movies. This exosuit looks more like sports clothing than R2-D2, yet it is equally programmable and carries out tasks on command; however, the exosuit is lightweight, flexible, virtually invisible to others, and individualizes itself for each patient. “We hope that it will soon enter clinical use where it undoubtedly could transform the lives of stroke patients for the better,” said Wyss Institute Director Donald Ingber. The study was supported by the Defense Advanced Research Projects Agency (DARPA) Warrior Web Program, grants from the National Science Foundation, the American Heart Association and the National Institutes of Health, a Rolex Award for Enterprise, the Harvard University Star Family Challenge, and Wyss Institute and SEAS funding. A testament to the resiliency of life on Earth, the tiny tardigrade can outlast any cosmic calamity, according to a new Oxford-Harvard study.